How long does it take to finish a marathon? The answer, based on our analysis of 230,251 finishers in 25 races: 4:24, on average. 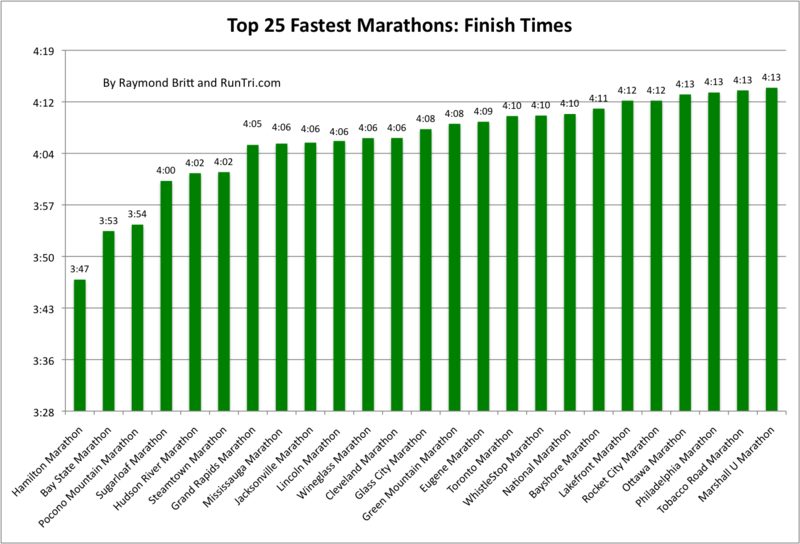 Here's how the average finish time stacks up against the 25. Naturally, the time it takes to finish a marathon will depend on your age. 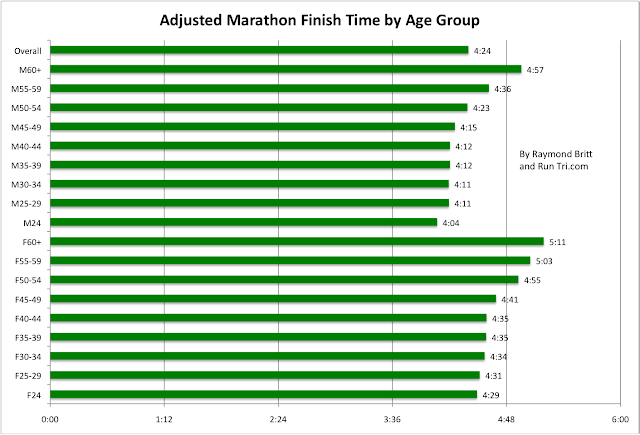 Based on our analysis of results by age group at Boston, Chicago and New York marathons, plus our own experience on those courses, we developed an Adjusted Marathon Finish Time by Age Group. Want to run an above average marathon? Beat these times. A lot of first-time marathoners define their goal as 'Beat Oprah'. They want to run faster than Oprah Winfrey did in her first and only marathon, the Marine Corps Marathon. What was Oprah's marathon time? She ran a 4:29 in the women's 40-44 age group, beating the adjusted time of 4:35. 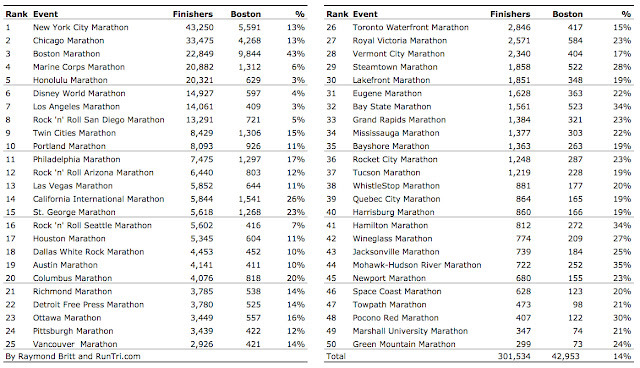 New for the 2011-2012 marathon season: we've analyzed 75 of the top marathons in North America -- with 330,000 finishers and 50,000 Boston Qualifiers -- to determine which ones are the biggest, toughest, fastest, and more. Beyond the numbers, we've got personal experience, having competed in many of the marathons listed here, a total of 85 marathons overall, to add credibility to the rankings. 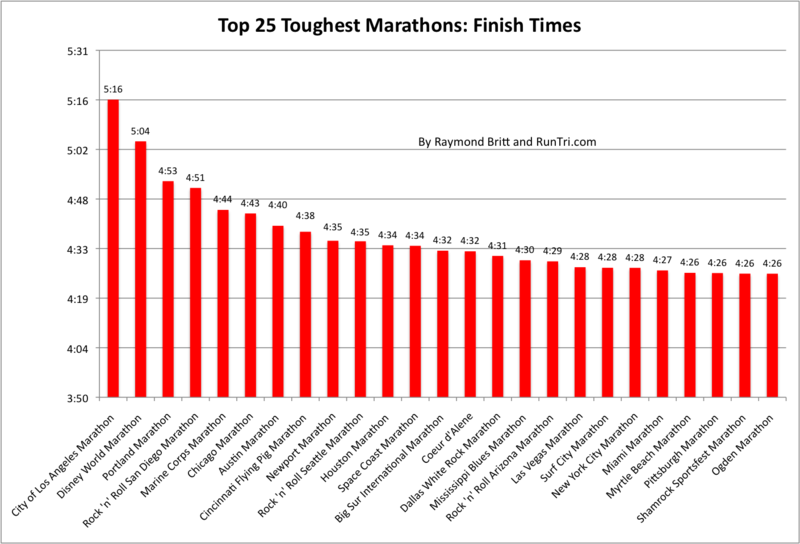 Toughest: Boston is toughest of our top 25, but with a deceptively fastest overall time, being exclusive to the qualified marathoners. 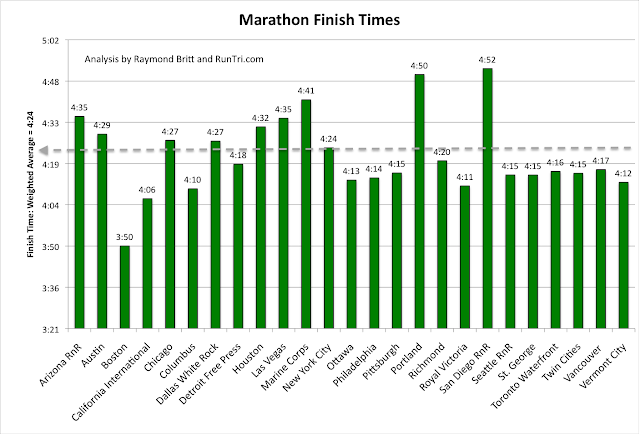 Among marathons open to all runners, Los Angeles, Disney World, Portland (Oregon), RnR San Diego and Marine Corps are most challenging, based on average finish times. Noteworthy: Chicago's 4:43 in 2010 ranked it 6th toughest overall. For more, see our detailed analysis of Chicago Finish Times by Age Group. Easiest: There is no such thing as an easy marathon. 26.2 miles is 26.2 miles, and competing in one is an awesome undertaking and an extraordinary achievement. But when it comes to faster marathon courses, Hamilton, Bay State, Pocono Mountain, Sugarloaf and Hudson River top the list. 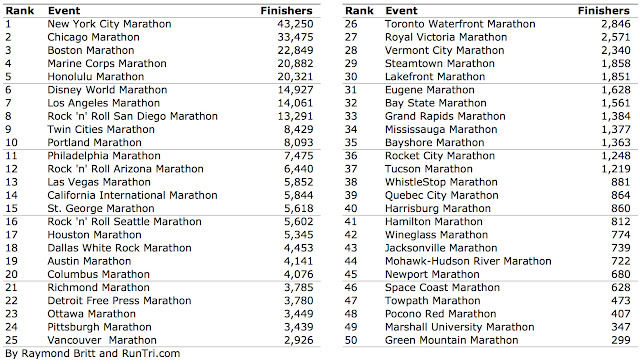 And yes, we know very well that there are many, many smaller marathons not on this list that are wicked hard. We limited the analysis to these races, representing hundreds of thousands of finishers. For more see our Complete Marathon Coverage, and more detailed analysis, below.